Meet Tom Tornstrom, PAAW's Treasurer since 2014. 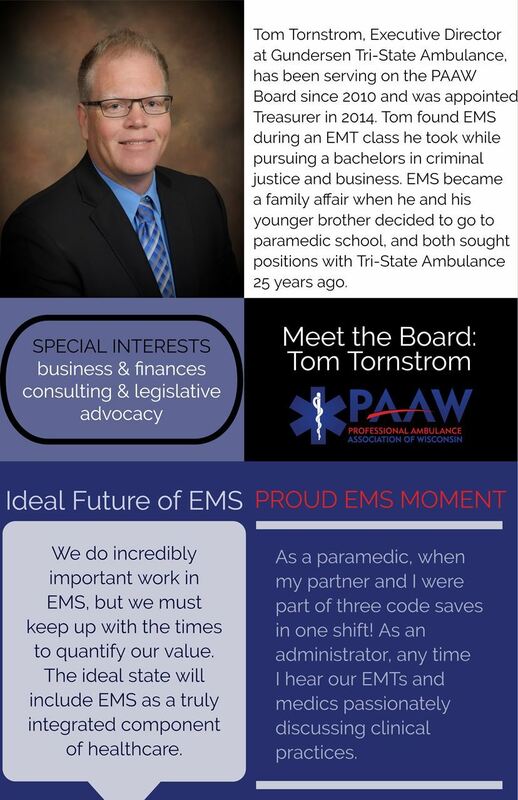 Tom leads Tri-State Ambulance, and also serves on the American Ambulance Association board. 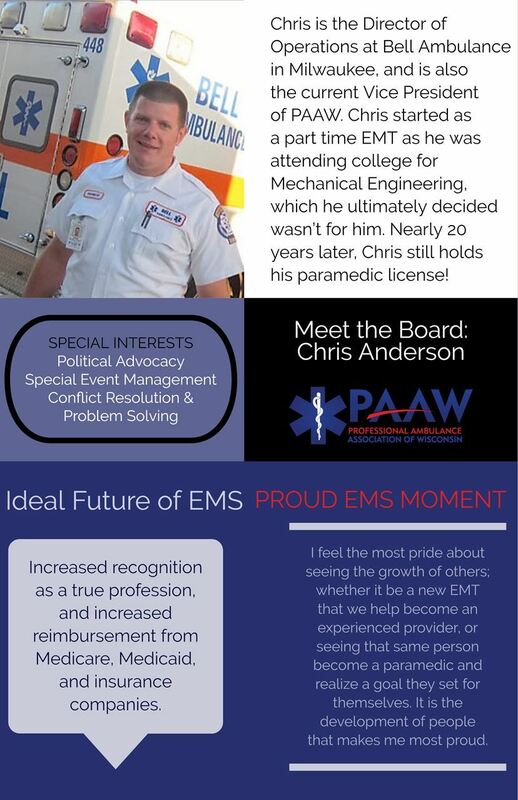 Meet PAAW Vice President Chris Anderson! Chris Anderson of Bell Ambulance has proudly served Wisconsin with world-class mobile healthcare for more than two decades. 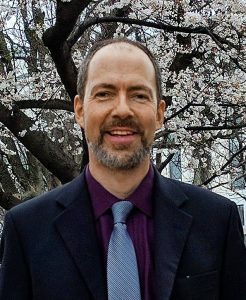 Meet PAAW Director Patrick Ryan! 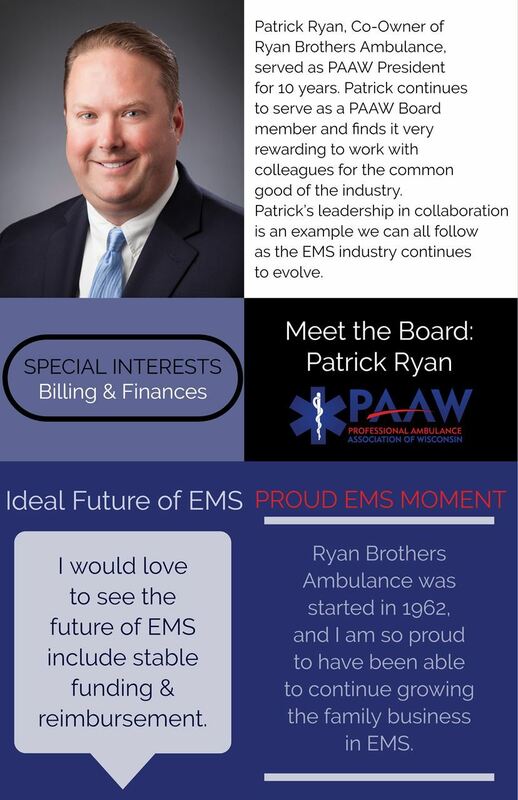 Patrick Ryan of Ryan Brothers Ambulance, has served Wisconsin mobile healthcare in a variety of roles over many years. Meet PAAW President Dana Sechler! You’re focused daily on ensuring that care for your patients is as effective as possible and that Wisconsin’s kids are as healthy as possible. WIAAP’s Pediatric Advocacy Day broadens the reach of your expertise beyond your practice and puts it into action to advocate for safer, healthier children in our state. This year’s focus is firearm safety – in response to our many members wanting to contribute their perspective with policymakers. As a physician, your messages count at the Capitol. Put that power to work with us in February! We'll make it as easy as possible - we will schedule meetings with legislators on your behalf, provide breakfast and lunch, and give you talking points and issue briefs to help you prepare for conversations with legislators. This event is open to all, and there is no charge to attend for WIAAP members. In honor of today's National Rural Health Day, the American Ambulance Association interviewed John Eich, Director of the Wisconsin Office of Rural Health. Amanda Riordan: Thank you for joining us today. My name is Amanda Riordan, and I am the vice president of member services for the American Ambulance Association. I'm also the administrator for the Professional Ambulance Association of Wisconsin. I'm so happy to have the opportunity to interview John Eich, the director of the Wisconsin Office of Rural Health. John is an exceptional contributor to rural health in Wisconsin. He's also a sterling advocate for the power of EMS to assist with public health in the least accessible areas of Wisconsin. I'll ask John a couple of questions today about the recent Rural EMS Listening Sessions that he conducted in a number of areas across the state. John, thanks again for joining us. Would you mind telling me a little bit about your background and how you became the director of the Wisconsin Office of Rural Health? John Eich: I appreciate your inviting me to talk about some of our programs, so thank you. I took a bit of a wandering path: I've done everything from carpentry and marketing to social work with homeless teens. I found my way to community [service] down in southern New Mexico. I caught the bug there working on behalf of the community and society at large. When I moved back home up to Wisconsin—I grew up in a rural area here in southern Wisconsin—I saw an opening and at the Office of Rural Health. I've been on board ever since, and it's a lot of fun. Amanda Riordan: Thanks so much. And we're so glad you took the position. Would you mind sharing a little bit about why EMS is so important to rural health? John Eich: If you're not familiar with an office of rural health, we receive mostly federal funding to work on the state level. There's an office in every state in the nation. Here in Wisconsin, we are funded mostly, I would say, to work with rural hospitals and EMS, and we find that EMS is one of the areas of greatest need. Every piece of the healthcare delivery system has its challenges and its strengths. EMS, I think by the nature of having formed itself—at least rural EMS formed itself—around the model of volunteer services. In my estimation, it has sort of painted itself into a corner. It started when medicine was not as complicated, and when populations, were not expecting as much. You were helping out your neighbors by getting somebody to a hospital. It has since evolved in a good way. [EMS has] evolved into a healthcare profession. And so there are a lot more demands. There's a lot more education; continuing education, learning new techniques that are lifesaving. Society depends on it. But that means that these volunteer services that started off small are under increasing pressure. That's why we are trying to dedicate as many of our resources as we can to helping out that system within Wisconsin, and it's paying great dividends. We've always really enjoyed our interactions with EMS. I think it takes a particular kind of person to do it. We just really enjoy our time with those who do the work. That led us to doing what we're calling a "Rural EMS Listening Session." So we did five of these sessions around the state in rural areas, and we intend to do a few more. Part of the idea was that so often policy in general happens in urban centers. In EMS policy, because the state capital is down in the very southern part of the state and Milwaukee, the largest city is also down in the southern part of the state, the rural areas of the state (which most of the rest of it) tend to feel ignored or unheard. It's much harder for them to participate. So if somebody has to drive five hours to go to a meeting that would take [a city resident] 15 minutes to drive to, that's a disparity in access and it's a disparity in having your voice heard. So we decided that it was important to go listening where rural EMS is practicing. So we did that, and are continuing to do so. It's been very eye opening. Obviously there was a lot that we expected to hear that we did hear. I mean, there's, there's not a lot new here. People in EMS know what the issue is as someone said these are the same ideas we've been talking about for the last 20 years or more. And that's very true. We like to believe that it's time for things to change. We've been talking about this long enough. Maybe we should do our best to push the issues forward. And that's phase two of these listening sessions: take what we heard and get it into the hands of advocates, like the EMS associations, fire associations, et cetera, and other advocates like the Office of Rural Health that try to speak on behalf of the needs of EMS. I do think I'm optimistic that legislators want to help. When they've been presented with bills, they're interested. Money is always an issue, but I would say that they definitely want to be part of a solution. So, it's all of our jobs to make sure that they have the right solutions and presented to them. Amanda Riordan: I think that's a great segue to one of your other very popular innovative programs in Wisconsin. The Office of Rural Health actually helped put together the EMS at the Capital Day event in 2017. Would you mind telling us a little bit more about what that entailed and the groups that participated? John Eich: Absolutely. So again, as we work with all parts of the healthcare delivery system, we work with hospitals and clinics and providers; physicians, PAs/physician assistants, nurse practitioners, the nurses that staff the hospitals and clinics and home health services. When we look at EMS, it always strikes me how it has a level of splintering that I don't see in other professions. In other professions, they've managed to sort of circle the wagons and get on the same page and present a united face to push forward their vision and their legislative goals. EMS, for whatever reason. I'm not sure why it seems to have done the work but also, identified a number of differences. You can be a paid or career staffer versus a volunteer. You can work in a rural service versus an urban. You can be in fire versus EMS. You could be a Paramedic or you could be a Basic EMT or an Emergency Medical Responder. Each of those areas, each of those groups, sort of huddle and identify amongst themselves. I would like to see them working more cohesively together and I'm sure they would as well. The effort that that led to an EMS Day at the Capital was to try and get all of the disparate groups together and on the same page. All of them had been working very diligently on the issues that were important to them, and I think there is a lot of overlap. As one of the participants said, "We can agree on a 80 percent of the issues, we may disagree about the 20 percent, but let's work on the 80 percent and when we get that done, then we can disagree about the rest of them." So that was the goal that brought the groups together. So we were lucky to be able to get the two EMS associations in the state, the state fire chiefs, and the professional firefighters. The state EMS board joined in with us as well as they could, in more of a listening capacity. We created a wish list of legislative issues and a lot of it was centered around education: who we are and what we do. And we took that to the state capital. We had tremendous turnout and we had uniforms marching through the, through the offices of the legislature both in the Assembly and the Senate. I like to think we got their attention and we plan to, as I said, take what we're learning from this rural EMS tour, connect with our urban allies as well, and get EMS advocacy on the same page so that they can do tremendous work together. With that in mind, and with all of the successes you've had helping execute your vision of moving EMS and rural health forward in Wisconsin, would you mind telling us a little bit about where you see the future of rural health going in your state, Wisconsin, as well as the country in general? John Eich: I take it you mean in EMS terms. Because there's a lot going on in healthcare, as you know! As far as EMS goes, I think the future of EMS care is not a wholly volunteer model. I think it is at least a hybrid model, and I think the industry needs to figure out how to make that transition. I think that's going to be a difficult and painful transition. I think it's going to take a lot of education to the local politicians who are used to having their services and frankly to be getting a pretty good deal. We talked recently to a small community. It was a countywide meeting, but it was held in a small community that had been [served by] a volunteer service. They said they had a core group of about five people. The chief of the service had had volunteered 4,280 hours last year. The rest of his staff [had volunteered] around the 3000-hour level. They were proud of that, understandably. They were also somewhat reluctant to consider another model in their mind. They felt that they were just fine. When I look at that from the outside, I think, "What if one of you tears an ACL as you're getting off the ambulance rig, what if two of you get the flu really bad? Which happens!" [What happens if] then there are two calls for EMS, at the same time, while two of your staff are bedridden. That's three people to make all those calls. I struggle with the vision of that is as sustainable. But when the local community looked at the numbers, they said, well, it looks like as far as the taxes go, that's about $12 per capita. I was a little horrified, and asked "is that per year?" And they said, "Oh yeah, yeah, that's per year." I was struck by the fact that I pay more for Netflix per month than these folks pay per year to have two highly trained individuals show up with the latest technology to save the lives of their loved ones. I'm not criticizing that, but I do think there's an opportunity there to really examine that in the daylight. And certainly when the board realized that and looked at it, there was a lot of sort of a flurry of questions back and forth. And is this true? On and on. I think the nature [of the matter is that] if you can possibly put the question to a citizen in a grocery store as they're walking out with their groceries, "How much would you pay per year in your taxes to have this kind of lifesaving service?" I don't think the answer would be $12 a year. I think it would be more, but I don't think most citizens or politicians have been given the opportunity to really look at. I think they assume it's already paid for. It's part of their taxes. I think they assume that Paramedics just show up at their door. They don't necessarily know the difference between a Paramedic and a Basic EMT or EMR. They have a great deal of faith and trust in these people, as they should. I think they're just not aware—they're not aware of the challenges and the lack of funding and the way the system is sort of precariously balanced on top of volunteer hours to an incredible amount. I think the future in my mind, if you look at the data and volunteerism trending down, it's trending down across all sectors, but that is hitting EMS very hard. If you look at staffing, we're seeing with low unemployment that means that it's harder and harder to fill positions. That especially happens in rural areas. People are moving to urban areas for jobs. There's not as many people there. If they do still live in the rural area, they tend to work in a neighboring larger town or other towns, so it's harder for them to volunteer. So I just think the data is pretty clear where we're headed. We just culturally have to try and do some heavy lifting and change the perceptions of what a society should pay for. As Dana Sechler from the Professional Ambulance Association of Wisconsin often says, we pay for garbage collection at $138, the median per capita cost per year. Like I said, some [areas are paying just] $12 per year for EMS. Garbage is very important. I don't mean to dismiss it, but I think we can do better for lifesavers. I see that as the primary issue. Garbage is very important. I don't mean to dismiss it, but I think we can do better for lifesavers. I see that as kind of the primary issue. I think another issue is certainly something we're hearing that is in rural areas, you have a lot of Emergency Medical Responders (EMRs). They're taking a class that is 80 hours [in duration] because they want to help their neighbors. They're not transporting— they are showing up to be of help. But they're taking the National Registry tests in Wisconsin, and the National Registry tests, for a lot of good reasons, is lifting the industry into a level of professionalism and knowledge that is important and necessary. But I think that certainly what we heard is that an EMR is sort of an entry level to this. So how can we figure out a way to lower the barriers to participation, without lowering the standards of care? That's something we need to look at. And I think frankly, as a nation, we need to look at that and have that conversation with the National Registry. I think they're doing the work that they do, and, and in a lot of ways it's good work, but I think they need to have feedback from their customers and all of us states are their customers. All of us need to maintain a dialogue with them and say, this is what we need. We may need critical thinking in our clinicians, but do we need it in our technicians? Do we need it in our EMRs? [For EMRs] do we need sort of tricky questions that two of them are correct and you have to sort of guess which correct answer you wanted to give? I think it's that sort of stuff that demoralizes local people who may not be eager to take a test in the first place and are a little put off by a computerized test in the second place. Then if they don't pass, they go right back home to their church, their gas station, and their bar and tell everybody how this impossible test is not worth their time. I'm not against the National Registry tests, but I do think that we need to have more conversation about it and we need to find ways to lower the barriers and maybe that's preparing EMRs in a different way. I've got a daughter who is preparing for the ACT [college entrance test], and she's learning the tips and tricks. She's in a class just to help her take that test, and a lot of it's not even about the content. Maybe since the National Registry is modeled on these other types of tests we need to train more on not necessarily the skill levels of how to save someone's life, but how to take a test, which seems a little weird. But if that is our standard, then we need to make sure that our people are prepared when they walk into that room. Amanda Riordan: That makes a lot of sense. Certainly we hear feedback in both directions from a variety of different stakeholders regarding the increasing professionalization of EMS. On one end, of course, we want to honor and maintain the contributions of those mission critical volunteer providers, particularly in rural areas, and on the other hand we have the push-pull of a Paramedic, in particular, looking for additional certifications and additional recognition of mobile health care as a profession. All of that mixed together with a flat or diminishing reimbursement makes sustaining a mobile healthcare/EMS in all areas really challenging. But of course as you so aptly pointed out, it especially impactful areas of our country and in a state like Wisconsin where you have so much land mass that is in rural areas. [These issues] particularly impact states of that nature is as they look forward to an aging population and the movement of younger people into urban areas. So truly appreciate those insights and those suggestions. And it's certainly something that I'm sure there will be continued dialogue about for years to come. Amanda Riordan: Makes complete sense and certainly something that we know so many communities are wrestling with right now. I thank you for bringing it to everyone's attention. I think that we will get some lively dialogue in the comments when we get this posted about, as you pointed out, the diminishing volunteerism as well as the other pressures facing most mobile healthcare these days. Before we wrap up here, would you mind giving us some tips or thoughts about how EMS providers, mobile healthcare providers, in Wisconsin can work best with your office? Or if you have any generalized tips about how ambulance services and fire departments across the country can best work with the Offices of Rural Health in their state, we would be very grateful. Clearly you are moving and shaking in Wisconsin and we'd love to see that ripple out to other states. John Eich: Absolutely. So, I have counterparts in every state and they're all doing great work when it comes to rural health and rural EMS. If someone in any state simply goes to Google and, enters their state name and "office of rural health," they'll get right to them. I think there is a difference between Offices of Rural Health. Many of us are in state government, and so what you experienced there is common of state government—It's a more bureaucratic system. The websites tend to be a little bit trickier to find the information because there's obviously a lot going on there and some political considerations. We [here in Wisconsin] are university-based. There's about 12 of those around the nation, and three that are nonprofit, so, even leaner and more flexible. So every [office] will look differently. I do think that EMS should reach out to their Offices of Rural Health to let them know about their needs, because when we look at metrics for healthcare and for population health, we see the metrics getting worse. It's almost like a horseshoe in that they get worse the more rural and remote you are. Suburban areas have the lowest need, and then the inner city tends to be equally challenging. We share a lot of population health issues with inner cities. The difference I think is really transportation. We're farther away. And if you don't have a car, you're really isolated and stuck, so EMS is mission critical. If you think about that first hour of care being so important to outcomes, [if sick or injured in a rural area] your first half hour could be without care as people are getting to you and you're trying to find a cell signal to actually call 911. Once they arrive, your rural EMS providers are the people that are giving you that care. So it is vitally important that those people have the resources to do their job the best that they can. Please reach out to express your needs. One of the things we've been talking about based on this Rural Listening Tour and talking with our state EMS office and the associations just yesterday is the idea of some kind of helpline; Somebody to answer the call when a service is identifying that they are really struggling, because [rural services] are a little nervous about calling the state and saying, "Hey, guess what? Things are really rough here. You might want to shut us down." Nobody wants that. The state EMS office is very clear that it's not in anybody's best interest to remove care and burden neighboring services. So getting a helpline with a number of resources and even someone that can drive out and sit across the table and talk through some issues and get some advice would be very helpful for some of these services that are really struggling. Those are some ways that I think folks can get involved, and I'm always interested in hearing more. Amanda Riordan: John, thank you so very much for your time and insights today. It has been an absolute pleasure talking to you and I'm sure that we'll be hearing a lot more from the Office of Rural Health, you, and your staff in the years to come. So again, we truly appreciate it and wish you a very happy National Rural Health Day tomorrow, November 15th. According to a Wisconsin Supreme Court decision in May 2017, attorneys hired to represent a patient are now considered a ‘person authorized by the patient’ when it comes to how you bill for records requests? PAAW members can find on our site the opinion, the statute, and the current fee schedule. Member organization Bell Ambulance shared their incidental finding with us last week, and after confirming our understanding with Scott Moore, HR and Operations consultant for the American Ambulance Association, we wanted to share this information with our members and partners throughout the state. In summary, there is no time that any person, authorized by the patient, can be charged a “retrieval or certification” fee for requests for records. The provider can charge the per page fee, but no the retrieval or certification fee. 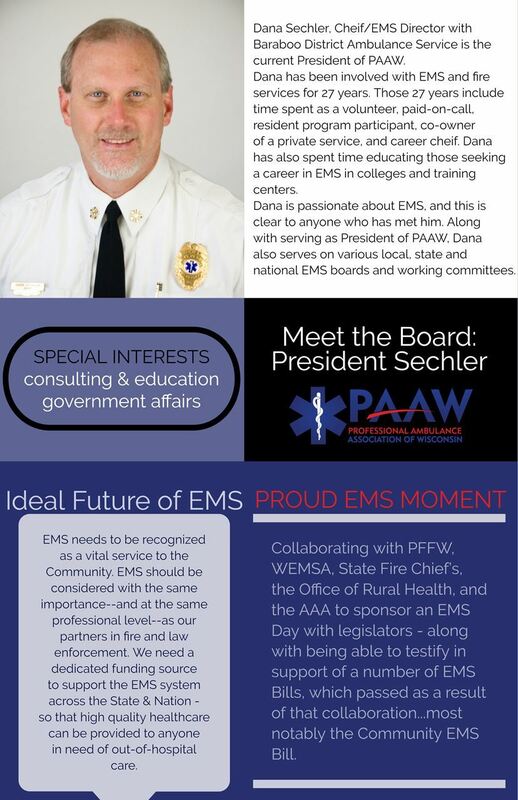 On Tuesday November 12, PAAW lobbyist Mike Brozek provided a recap of the recent elections, and shared his thoughts on how it will affect EMS in Wisconsin and across the US. Here are the high-points. The recount in Arizona likely to go to Kyrsten Sinema, while the Florida recount is still in progress. Overall, the GOP maintained a majority in the senate, however it is a smaller majority than before. The Democrats now hold a small majority in the House. We knew the race for Governor was going to be close in Wisconsin. Below are a few factors why Governor Walker lost and what we can expect to see from Governor-Elect Evers as we move forward. Polls can’t be trusted, necessarily, as it all depends how questions are phrased; Marquette poll showed him neck and neck throughout the race. He will be governing with both chambers firmly Republican, which may result in a slower state agenda and perhaps increased conflict. Governors have extra power in years before reapportionment. Redistricting will likely end up in court. Focused on education, transportation, healthcare but there was little information about logistics. Maggie Gau was Gov-Elect Evers campaign manager and has been appointed Chief of Staff. Her role in playing “traffic cop” for access to Evers will be challenging. When we know the members of the transition team, we can start reaching out. Governor Evers has been a constitutional officer for the state for many years already, which is unusual. He is familiar with bureaucracy. Overall, there was very little change in the Wisconsin Assembly – the Republicans did gain 1 seat. The loss of Brad Schimel was a bit surprising! Josh Kaul is the new Attorney General for the State of Wisconsin. Mike believes we will likely see radical changes in personnel. Although we are not sure yet who will be selected, we do know each Governor brings in his own people. It is possible we may see some Democratic members of the legislature be selected. Wisconsin is changing its party composition and the suburbs around Milwaukee broke more Democratic than expected. Wisconsin seems to be a microcosm – reflective of the trends we’re seeing nationally. We will learn more at the State of the State address, however, some things may remain unresolved even by then. We know the new governor will bring in his own budget, but we also know this will be challenging as it will be presented to a GOP-majority legislature. I anticipate some contracts will extend by 6 months to avoid any issues of continuity. In Wisconsin, a Republican is still at the helm of Medicaid. Evers could have radical changes, or very few – he has not shared many concrete plans about healthcare. Wisconsin took federal Medicaid money, and is at (about) a 70/30 split in favor of federal funding; the $9 billion-dollar budget includes quite a bit of Federal money. Even as the department’s budget increased from $7b to $9b, EMS did not receive any additional funds. PAAW continues to be in support of removing ‘ambulance’ language from NEMT (non-emergency medical transport) contracts. PAAW’s immediate past president Patrick Ryan is meeting with Mahlon Mitchell, President of the Professional Fire Fighters of Wisconsin, to discuss how they can continue to make progress via coalition. Although the Governor ran on healthcare as one of his three principals, it is not yet clear where he stands on balanced billing. PAAW is advised to do a complete inventory of history and future goals to develop a strategy and priorities. Change may bring opportunity. PAAW will work to host another update call with Mike Brozek or distribute additional content once the transition team is in place and additional details become clear. Attention PAAW members! Interested in participating in the new Reimbursement or Government Affairs Committees? Complete our short form to be considered. Thank you for your support and participation! Welcome to the Board, Nick Romenesko of Gold Cross! Nick Romenesko was voted on the PAAW Board during executive session at the September 20th meeting. Nick brings with him nine years of experience in EMS. I have watched Nick grow as a paramedic throughout his career at member organization Gold Cross Ambulance; he is smart, dedicated and incredibly professional. He knows how to have fun and make you laugh after a tough call, but also pushes himself and those around him to improve each day. Here’s the thing about Nick, though...you know all those dreaded millennials people are always pontificating about? Yep – he’s one of them! A few weeks ago, Nick was promoted to Systems Director at Gold Cross Ambulance Service, Inc. and when I shared the news with a colleague the immediate response was “isn’t he really young for that?”. Yes, he is young, but he is also driven, committed and, most importantly, capable. Nick started his EMS career in Milwaukee a with member-organization Bell Ambulance and then returned to the Fox Valley as a paramedic with Gold Cross where he flourished. 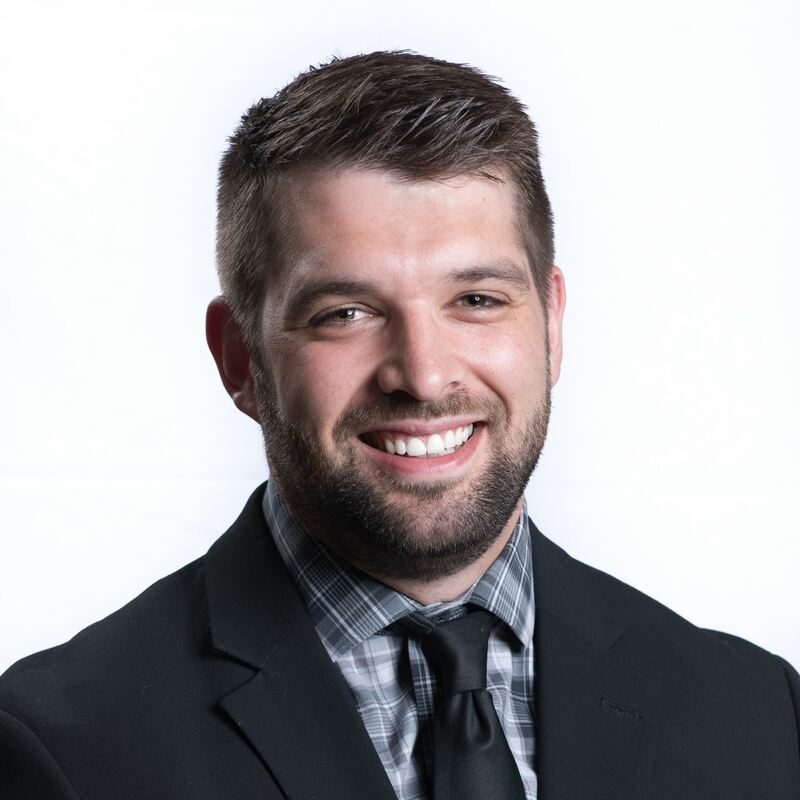 Nick chaired the Safety Committee and became integral to the internal education and quality program while earning his bachelor’s degree in organizational leadership. I think the most important thing to note about Nick, is that he cares. He cares about his people, he cares about his work, the organization he’s charged with leading, and he cares about the future of EMS for everyone involved. There has been a lot of talk over the past few years about attracting, retaining and engaging millennials – we even had a session dedicated to the topic at Midwest EMS Expo, and PAAW published two podcasts on the subject – perhaps electing one to the board is a good start at bridging the generational divide. Congratulations, Nick, and welcome to PAAW! © 2005–2018 Professional Ambulance Association of Wisconsin, Inc. All Rights Reserved. Professional Ambulance Association of Wisconsin, Inc.